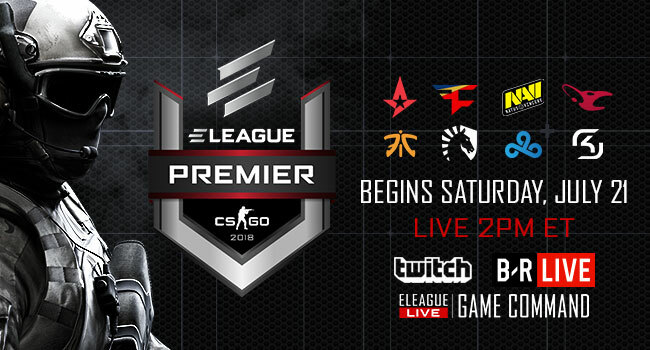 ELEAGUE, the premium esports content and live tournament brand from Turner and IMG, will feature a stacked field of the world’s best Counter-Strike: Global Offensive teams in action for its fifth non-major CS:GO competition – the ELEAGUE CS:GO Premier 2018. Live tournament coverage will begin Saturday, July 21, at 2 p.m. ET on the ELEAGUETV Twitch channel, and will also be available free of charge on B/R Live. In addition, live coverage will be available through ELEAGUE’s award-winning Game Command mosaic video player, which gives viewers access to thousands of different in-game viewing angles. A multi-part feature series revisiting the tournament’s best moments will be presented beginning Friday, Aug. 24, on TBS. During the Group Stage, held Saturday, July 21-Wednesday, July 25, the top eight-ranked teams in the world – according to their positions in the HLTV.org rankings from May 21, 2018 – will compete at ELEAGUE Arena for a one million dollar purse. FaZe Clan No. 2 E.U. Teams will be split into two groups of four teams each, and will play best-of-three matches in a double elimination bracket. The top two performing teams from both groups will advance to the single elimination Playoffs, held Saturday and Sunday, July 28-29. The winning team will be crowned ELEAGUE Champion and receive the largest share of prize money. 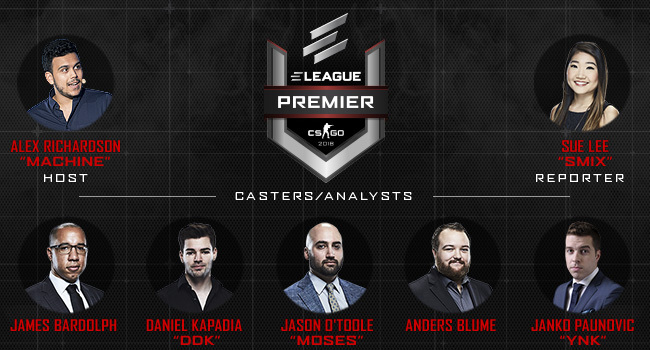 ELEAGUE’s coverage of the CS:GO Premier 2018 will be delivered by an enthusiastic team of seasoned Counter-Strike experts, including former professional players Jason “Moses” O’Toole and Janko “YNk” Paunovic. Anders Blume – widely known as the “Voice of Counter-Strike” – will return to ELEAGUE as a commentator, joined by James Bardolph and Daniel “DDK” Kapadia, who most recently appeared during coverage of the historic ELEAGUE Major: Boston. Alex “Machine” Richardson will make his ELEAGUE debut as host of the CS:GO Premier 2018, and Sue “Smix” Lee will provide the latest from the ELEAGUE Arena stage during the Playoffs (July 28-29). Fans interested in attending the live CS:GO Premier 2018 action at ELEAGUE Arena in Atlanta on July 28-29 can get free studio audience tickets here. Ticketed attendees will have access to a CS:GO-themed fan experience with autograph sessions, concessions, raffles and giveaways. General admission seating will be offered on a first come, first serve basis.